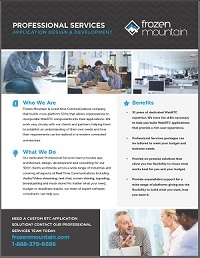 At Frozen Mountain we understand that on many occasions an organization does not have their own internal resources to carry out a complete Real-Time Communications development project with unique requirements within a tight timeline. The Frozen Mountain Professional Services team of senior developers and project managers are here to help. Whether creating a component of your application, developing the alpha version for your own development team to make production ready, or developing your complete end-to-end application, our professional services team of WebRTC experts is here to help you make your application development a success! Our Professional Services team has successfully helped many customers with projects ranging from 1 month to several years. We can help you too. Contact us today to discuss your unique project needs. Interested in completing your project with our Professional Services team?